There may be sometimes when a wild animal will figure out how to get into your house. Either by finding a whole or gap somewhere in the siding of your home, or simply by coming in through an open window or door, a raccoon, squirrel, possum, or even such animals as a deer may find their way into your house. They are often looking for some form of shelter, but most often are seeking to find food. Because of the fact that most people have a large amount of food in their home, it is not difficult for them to be able to locate some kind of meal or snack for themselves. This is why your house makes the perfect option for them. However, you don’t want these animals in your home, and want to try to remove them as quickly as possible. One of the best options that you can choose is to use a snare pole. You may think that this sounds like a great alternative but have no idea on how to catch a wild animal with a snare pole. Believe us when we say that it is a lot easier than you may think. You are familiar with the snare pole this is nothing more than a long pole that has a loop at the end of it. The loop is made so that the loop at the end is made using a noose. 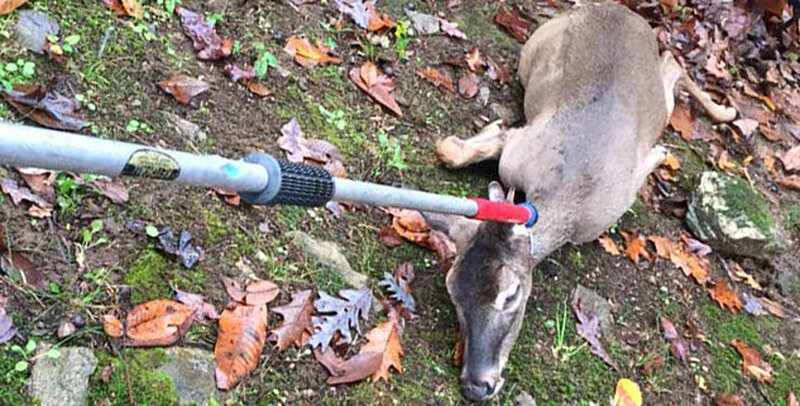 As you tighten the snare pole by pulling on the handle, you tighten the noose as well, giving it a better grip around the animal you were trying to capture the benefits of this pole is that it allows you to gain control over an animal without having to come in physical contact with it. This is why so many really love this option. To use the pole is quite simple. Before approaching the animal you want to make sure that you have dawned clothing that protect all of the exposed areas of your skin. Just to be on the safe side, it is a good idea to make sure that you are wearing a surgical mask, goggles, boots, and heavy gloves. The gloves should make sure that you can get a solid grip on the pole while also not having to worry about the animal being able to jerk it away from you. Some of these animals may really battle with you, so you need to make sure you have as good of a grip as you can.